Thinking about vulnerability and thinking about it together on this occasion are both notoriously difficult things to do. Is our thinking about vulnerability together a merely contingent fact, or is there something about vulnerability that becomes understandable only when we understand it as social relation? Does vulnerability not implicate us as social creatures who are vulnerable in relation to one another and vulnerable also by virtue of the social structures and institutions, ecological networks, and biopolitical regulations on which we depend for our persistence and well-being? It seems that to speak about this topic requires speaking about the resistance to speaking about this topic. There are those who worry that vulnerability, if it becomes a theme or a problem for thinking, will be asserted as a primary existential condition, ontological and constitutive, and that this sort of foundationalism will founder on the same rocky shores as have others, such as the ethics of care or maternal thinking. Does a turn to vulnerability seek to reintroduce into public discourse those particular modalities of thinking and valuing? Is it smuggling in discounted paradigms for reconsideration? The resistance to vulnerability is also sometimes based on political grounds. After all, if women or minorities seek to establish themselves as vulnerable, do they unwittingly or wittingly seek to establish a protected status, subject to a paternalistic set of powers that must safeguard the vulnerable—that is, those presumed to be weak and in need of protection? Does the discourse of vulnerability discount the political agency of the subjugated? So one question that emerges from any such discussion is whether the discourse on vulnerability shores up paternalistic power, relegating the condition of vulnerability to those who suffer discrimination, exploitation, or violence. What about the power of those who are oppressed? And what about the vulnerability of paternalistic institutions themselves? After all, if they can be contested, brought down, or rebuilt on egalitarian grounds, then paternalism is vulnerable to a dismantling of its power. And when this dismantling is undertaken by subjugated peoples, do they not establish themselves as something other than, or more than, vulnerable? Indeed, do we want to say that they overcome their vulnerability at such moments, which is to assume that vulnerability is negated when it converts into agency? Or is vulnerability still there, now assuming a different form? Finally, there are political objections to dominant groups who claim to be vulnerable. In California, when white people were losing their status as a majority, some of them claimed that they were a vulnerable population. Colonial states have lamented their vulnerability to attack by those they colonize and sought general sympathy on the basis of that claim. Some men have complained that feminism has made them into a vulnerable population and that they are now targeted for discrimination. Various European national identities now claim to be under attack by new immigrant communities. We can see that the term vulnerable has a way of shifting, and since we may not like some or even many of the shifts it makes, we may find ourselves awkwardly opposed to vulnerability. Of course, that is a rather funny thing to say, since we might conjecture that any amount of opposition to vulnerability does not exactly defeat its operation in our bodily and social lives. When we oppose vulnerability as a political term, is it because we would like to see ourselves as agentic or think that better political consequences will follow if we are that way? If we oppose vulnerability in the name of agency, does that imply that we prefer to see ourselves as acting instead of being acted upon? And how might we then describe those regions of both aesthetics and ethics that consider that our receptivity is bound up with our responsiveness, that we are acted upon by what we also act upon at the same time? Does the opposition to vulnerability also imperil a host of related terms of responsiveness, including impressionability, susceptibility, injurability, openness, indignation, outrage, and even resistance? If nothing acts upon me against my will or without my advanced knowledge, then there is only sovereignty, the posture of control over the property that I have and that I am, a seemingly sturdy and self-centered form of the thinking I that cloaks those fault lines in the self that cannot be overcome. What form of politics is supported by this adamant disavowal? So perhaps I have made some preliminary headway into thinking about the resistance to vulnerability. There is a dual relation to resistance that helps us understand what we mean by vulnerability. On the one hand, there is a resistance to vulnerability that takes both psychic and political dimensions; on the other hand, vulnerability changes its meaning when it becomes understood as part of the practice of political resistance.1 There are, I argue, forms of political resistance that rely fundamentally on the mobilization of vulnerability, and these are very different from political notions that establish agency as the opposite of vulnerability—that is, as something that requires or induces the vanquishing of vulnerability, or its full conversion into its ostensible opposite. Quite apart from the psychological resistance to vulnerability, there are legitimate political criticisms of some of the appropriations of vulnerability, most notably, (a) paternalism and the reification of certain populations as definitionally “vulnerable”—a move that risks making lack of power into an enduring condition for those populations and (b) the cynical inversion of relations of power, such that those who are dominant claim to be unacceptably vulnerable to those who seek equality, democracy, the end of colonialism, or reparation for past injuries. In my view, it will not do to embrace vulnerability or get in touch with our feelings or bare our fault lines as if that would launch a new mode of authenticity or inaugurate a new order of moral values. I am not in favor of such a move, since it would continue to locate vulnerability as the opposite of agency and to identify agency with sovereign modes of defensiveness. It ratifies the logic that understands the two as mutually exclusive and restrictively defined within that binary frame. Rather, I am proposing that once we see how vulnerability enters into agency, then our understanding of both terms can change. This change can happen if we reflect on forms of political resistance that depend upon the mobilization of vulnerability. Vulnerability, however, is not a subjective disposition but a relation to a field of objects, forces, and passions that impinge upon or affect us in some way. As a way of being related to what is not me and not fully masterable, vulnerability is a kind of relationship that belongs to that ambiguous region in which receptivity and responsiveness are not clearly separable from each other, and not distinguished as separate moments in a sequence. I am aware that I have used resistance in at least two ways: first, as the resistance to vulnerability that characterizes thinking that models itself on mastery; second, as a social and political form that is informed by vulnerability and is therefore not one of its opposites. Vulnerability is neither fully passive nor fully active but operates in a middle region if not a middle voice (White). I think about those practices of deliberate exposure to police or military violence in which bodies, put on the line, either receive blows or seek to stop violence as living blockades or barriers. In such practices of nonviolent resistance, we can come to understand bodily vulnerability as something that is actually marshaled or mobilized for the purpose of resistance. Such a claim is controversial, since this exposure can seem allied with self-destruction, but what interests me is the kind of nonviolent resistance that mobilizes vulnerability in order to assert existence, the right to public space, and equality and to oppose police, security, and military violence. We may think that these are isolated moments when a group decides in advance to produce a blockade or to link arms in order to lay claim to public space or to resist being removed by the police. And that is surely true, as it was in Berkeley in 2011, when a group of students and faculty members were assaulted by campus police as they were practicing nonviolent protest (Asimov and Berton). But consider as well that for women and transgendered people in many places in the world who wish to walk the street at night in safety, the moment of appearing on the street involves a deliberate risk of exposure to force. Groups who gather without permits and without weapons to oppose privatization and rally for democracy, as we saw in Gezi Park in Istanbul in June 2013, are actively taking that risk. Such groups may have no legal and police protection, but they are not for that reason reduced to some sort of bare life. There is no sovereign power jettisoning the subject outside the domain of the political as such; rather, there is a renewal of popular sovereignty outside and against the terms of state sovereignty and police power, one that involves a concerted and corporeal form of exposure and resistance. An image widely circulated on the Internet has been called “Woman in Red Dress,” and it became a rallying point for the resistance to police brutality in Gezi Park in June 2013. In this picture, Ceyda Sungur, a research assistant at Istanbul Technical University, is being pepper-sprayed by police in full riot gear. The image is a difficult one, to be sure. It is an act of brute force leveled against a woman in a red, cotton dress holding a canvas bag. She looks precisely like someone trying to enjoy a summer day in the park, but she has arrived to be part of the rally. She does not walk deliberately into harm’s way, but when the pepper spray comes at her, she stands firm, looking away to protect her eyes. The image is effective: a woman, unarmed and manifestly vulnerable, offsets the brutality of the police. I am reminded that there are at least two films called The Woman in Red. In the 1984 Gene Wilder version, the woman in red is passing over a grate on the street as the wind funnels upward to lift her skirts and mess her hair, leaving her looking sexually ravaged—a clear reference to the image of Marilyn Monroe in a white dress in the 1955 film The Seven Year Itch. 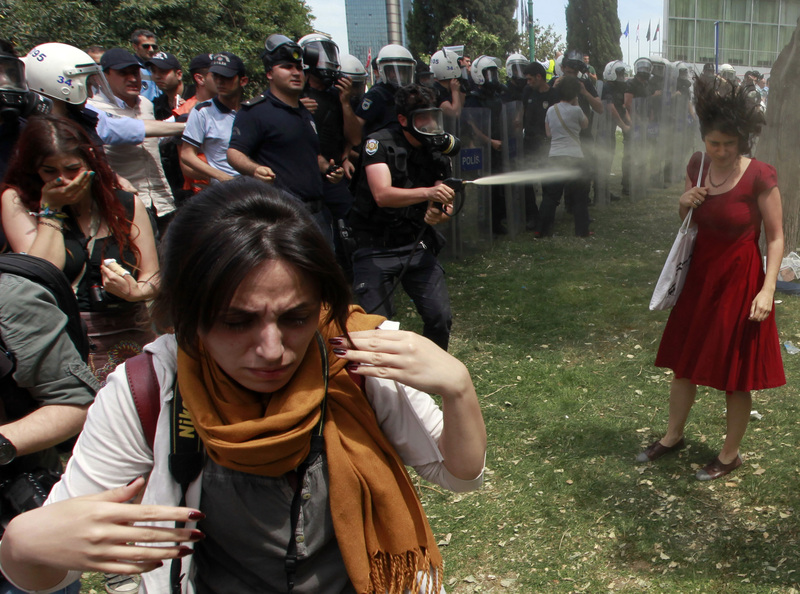 The Gezi Park image, however, is not a site of obsessive focus: the pepper spray that messes up the woman’s hair and blows her dress indicts the police use of sexual attack and gender violence. It is important to remember that among those who gathered in Gezi Park to protect the public status of those grounds against state-led efforts at privatization were not only lesbian, gay, and transgender people, who had quite rarely been able to gather in a public space with the solidarity of a broader movement, but also women insisting on their right to walk the streets at night without harassment and the threat of sexual assault. In the image, the woman remains uncannily firm as the spray is unleashed against her. She does not run, flee, or fall but remains in place. Remaining in place has marked a number of the actions in Gezi as groups refused to move or formed human barricades—the example of the standing man, for instance (“‘Standing Man’”). Although the iconic dimension of the photo seems to rely on the subordinate and sexualized status of the woman in red, I want to suggest that we are seeing a form of deliberate exposure that mobilizes vulnerability in a practice of resistance that belongs to a direct democracy movement. By “deliberate,” I do not mean that the woman is staging this scene. She is in fact suffering an unwanted assault; but in suffering it, she stands firm and thereby exposes the force unleashed against her. Note that her exposure is not only to the pepper spray but also to the camera recording the event, which operates as an iconic corporeal vector through which that local violence is relayed into a global visual field. She does not initiate what happens but, like so many others, improvises when it happens. Does the improvising diminish the violence by showing that there is nevertheless a form of agency at work here? I think not. Like many nonviolent actions, the power or capacity to take the blow without returning it in kind serves not only as an embodied critique of violence but also as an exercise of the right to stand one’s ground in concert with others, to claim or reclaim public space as public, and to mobilize vulnerability—for example, by redeploying the iconic charge of the image for global media. The agency here belongs to the camera, the crowd, and the bodies in place. It is effective precisely because the situation is unwanted and unwilled. The woman figured has not brought the assault on herself, but she does enter into a scene of ongoing assault to resist it. At one level, it indeed seems that brutality was unleased upon her as she walked in the park with her canvas bag and red dress. It is equally true that she was already part of the movement, having joined the assembly and exercised those everyday freedoms that belong to a public park: strolling, baring one’s arms to the warm sun, even wearing red, the color of the Turkish national flag. Wearing red, she seizes the iconicity of the national—and perhaps lets it resonate with Hollywood and with the political reach of the camera more generally—to oppose the state. The camera is part of the movement, providing testimony and archive, entering the image into the circuit of media distribution that establishes the local events as global and exposes the injustice. Vulnerability, then, can emerge in resistance movements and direct democracy as a deliberate mobilization of bodily exposure. “Mobilization of bodily exposure” is an embarrassing phrase, but it challenges the notions that vulnerability is identified with victimization alone and that the deliberate use of vulnerability constitutes a form of agency that overcomes injurability. I suggested above that we are dealing with two senses of resistance here: resistance to vulnerability that belongs to certain projects of thought and certain formations of politics organized by sovereign mastery; resistance to unjust and violent regimes that mobilizes vulnerability as part of its own exercise of power. I have now tried to suggest that the body is exposed both to police force and to photographic capture, and on some occasions (not all) photographic journalism still has the power to exploit and reverse visual icons of sexualized violence. The scene of vulnerability is not a subjective feature of the human, nor is it an existential condition. It names a set of relations between sensate beings and the field of objects, organizations, life processes, and institutions that make livable life possible. These relations invariably involve degrees and modalities of receptivity and responsiveness that, working together, do not precisely form a sequence. In political life, it often seems that some injustice happens and that then there is a response, but it may be that the response is happening as the injustice occurs. This simultaneity gives us another way to think about historical events, action, passion, and forms of resistance. Without being able to think about vulnerability, we cannot think about resistance, and by thinking about resistance, we are already under way, dismantling the resistance to vulnerability in order precisely to resist. Asimov, Nanette, and Justin Berton. “UC Campus Police Move in on Student Protesters.” SFGate. Hearst Communications, 9 Nov. 2011. Web. 24 Feb. 2014. Rose, Jacqueline. The Last Resistance. London: Verso, 2007. Print. “‘Standing Man’ Goes Viral, Inspires Silent Protests in Turkey.” NBC News. NBCNews.com, 18 June 2013. Web. 24 Feb. 2014. Photoblog. White, Hayden. “Writing in the Middle Voice.” The Fiction of Narrative: Essays on History, Literature, and Theory, 1957–2007. Baltimore: Johns Hopkins UP, 2010. 255–62. Print. The Woman in Red. Dir. Gene Wilder. Orion Pictures, 1984. Film. Judith Butler is Wun Tsun Tam Mellon Visiting Professor of the Humanities at Columbia University and Maxine Elliot Professor in the Department of Comparative Literature at the University of California, Berkeley. A version of this paper was presented at the 2014 MLA convention in Chicago.